Diamond solitaire pendants, hand set to reflect natural brilliance from beautiful certified diamonds. Each pendant within our collection is part of a wide choice of dazzling designs. Diamond shapes range from the round brilliant cut to the sublime emerald cut. 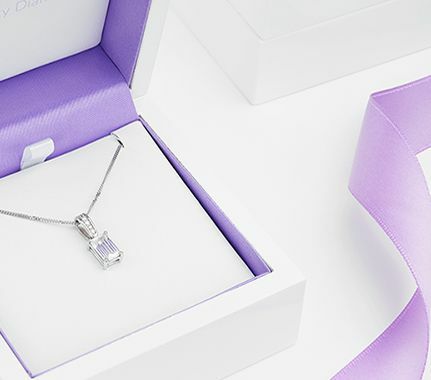 Our solitaire pendant styles range from vintage designs to simple classic solitaires, styled with minimalism to frame your diamond. Choose from a wide range of precious metals including Platinum, 18ct Gold and Fairtrade 18ct Gold. All commissions arrive with a secure chain, beautifully presented in our luxury pendant packaging. Diamond solitaire pendants are single diamond pendants. This jewellery style is otherwise known as a diamond solitaire necklace. Our chosen designs are carefully selected to reveal the true brilliance of each diamond used. Choose from a range of designs from Tiffany style necklace settings to floating designs. We create most styles to accommodate a range of diamond sizes including the popular 1 carat solitaire pendant. Choose from D colour to J colour and from IF clarity to SI2 clarity. We favour GIA certification with most commissions. We hand craft designs which take between 3 weeks and 5 weeks, meticulously hand set and mirror polished, delivered worldwide to UK, Ireland, Europe, USA, Canada and Australia, always beautifully presented in luxury packaging, hand delivered to your door by secure courier.